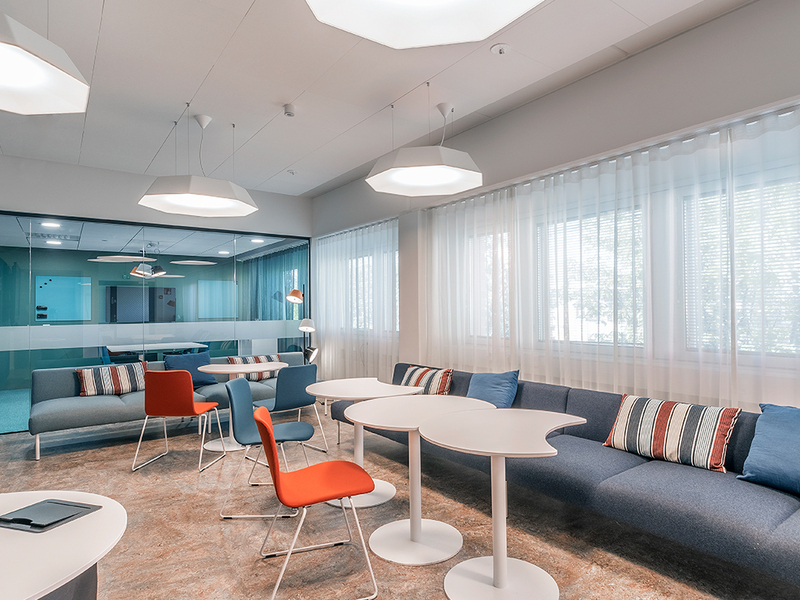 Interior architects Gullstén & Inkinen carried out the head design, architectural design and interior design of the Malmi, Ylöjärvi and Joensuu office renovations for the Social Insurance Institution of Finland (KELA). 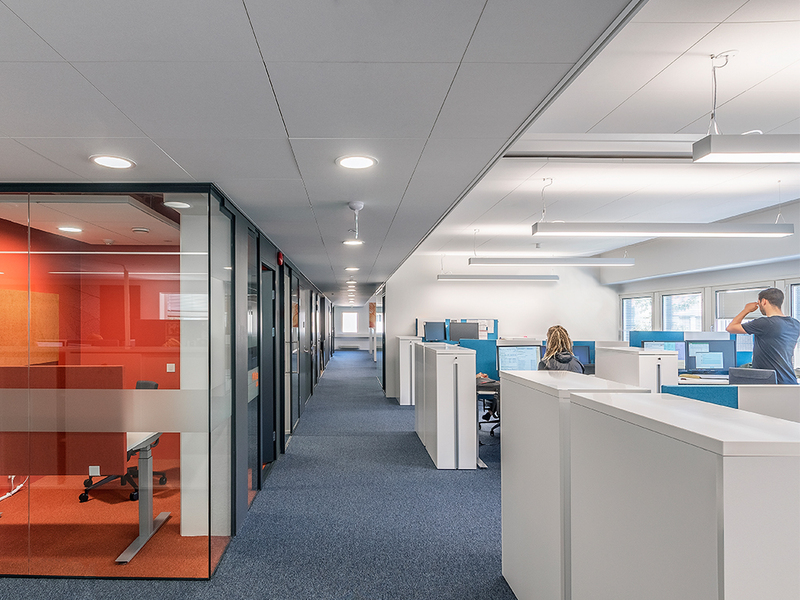 The purpose of the projects was to create more work space for the growing personnel of Kela and to support flexibility and increase comfort at work. An increasing number of the Kela personnel now work in activity-based offices. Turquoise and orange. Plenty of transparency. The feeling of quality. New and tidy. This is how the revamped Kela offices in Malmi appear. In addition to the visual appearance, the premises encompass completely new functionality. 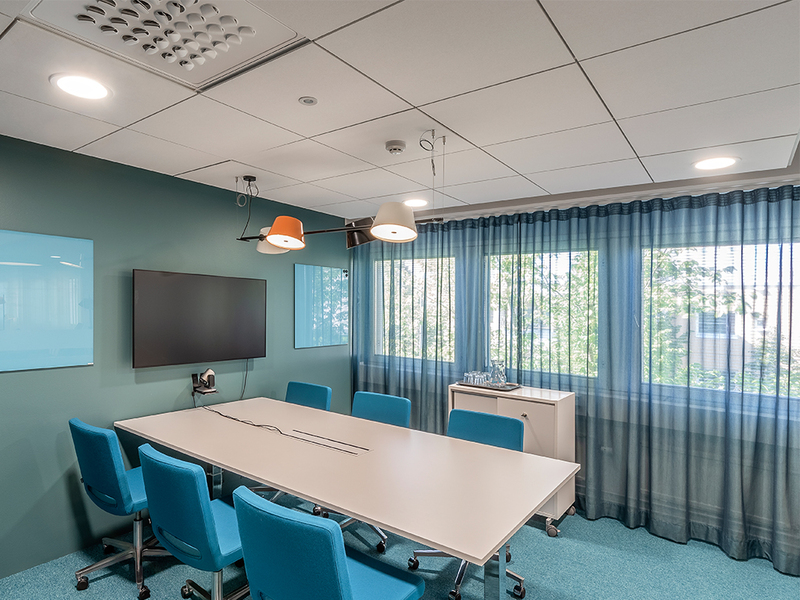 Previously about twenty people worked in individual rooms on the third floor of the Malmi offices; now after the renovation the whole floor is an activity-based office that includes 56 work stations. The employees sit in groups of 8 to 12 persons in an open office. They share the meeting rooms, withdrawal booths and a large working lounge that also serves as a cafe, break room and team meeting room. Team manager Eva Forsell considers the renovation a success. She says that moving over into activity-based offices has increased interaction among the staff and created a sense of communality. The new premises for Kela were completed in the end of 2016. 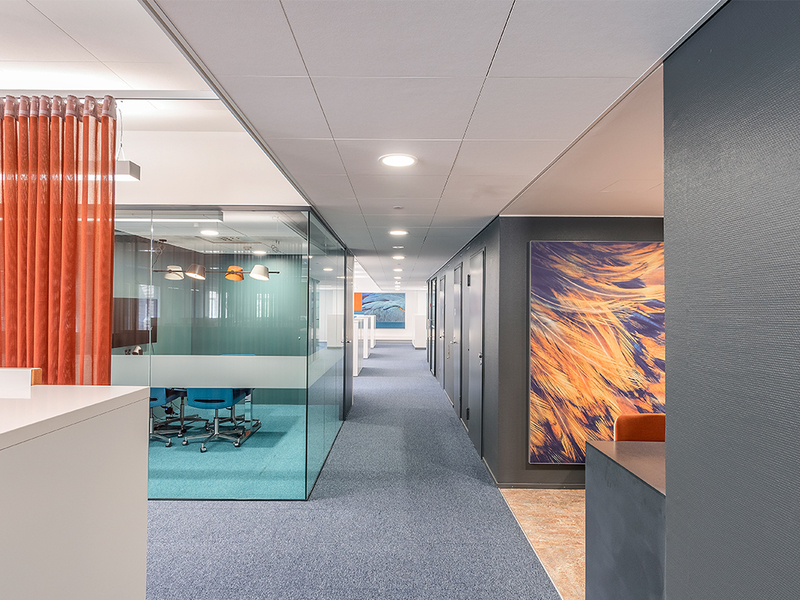 The primary purpose of the renovation was to create more working space. In the beginning of 2017, the national income support services were transferred from the municipalities to be handled by Kela, and this brought many new people to work in Malmi as well as many other Kela offices. The Kela service network consists of 180 offices around Finland. They are cared for by Kela’s property services. “We aim to provide the Kela personnel with quality offices that are comfortable and well proportioned. The ways of working are changing, and the premises must conform to that change,” says architect Pentti Nurminen from Kela’s property services. According to Nurminen the renovation requirements are always considered per location. The general condition of the premises adds pressure to the process. “Kela owns many properties built in the 1980s and 1990s. They typically house building services technology that requires updating. Many locations include solutions that are now out-of-date and can be utilized for a new purpose. For example, paper documents require much less storage space than before. Some old properties still have ‘letter lifts’ between the floors. They haven’t been in use for a long time,” Nurminen notes. Gullstén-Inkinen was in charge of the spatial design of the Kela offices in Malmi, Ylöjärvi and Joensuu. All three are now activity-based offices. The design was carried out in two phases. In the first phase consisted of testing, the Gullstén-Inkinen design team providing a proposal for the future layout, including the number of work stations and supporting units. In the implementation phase, they chose the materials and designed the visual appearance. User needs were surveyed with a questionnaire about the work environment and by active communications and staff engagement. Team manager Eva Forsell of the Malmi offices congratulates Gullstén-Inkinen for this. “Moving from separate rooms to an activity-based office has been a huge change. It’s not only about the premises but a change in our working culture. 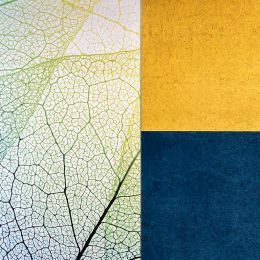 We appreciate being included in the design and influencing matters that concern our work. We felt that they really listened to us,” she says. “Working with the Gullstén-Inkinen designers was fluent. They were active, brought up valuable points and listened to us. We all worked towards a common goal: having everything ready by 15 November 2016. And we succeeded in this,” confirms Forsell.